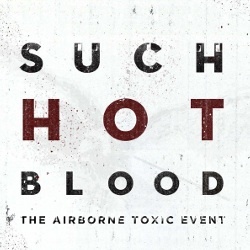 The Airborne Toxic Event: Such Hot Blood ~ Out Tuesday! There are so many ghosts. Whether it’s the lingering scent of a departed lover or the voices of departed family members, the feeling of loss is profound, and dealing with loss over and over again can disfigure you. But despite that, there is also strength to be gathered from all those memories and the ceaseless voices. 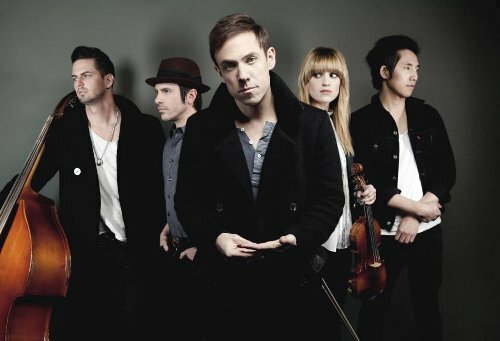 Since The Airborne Toxic Event’s first album in 2008, loss has been a central theme. It’s been a yin and yang of heartbreak and hope, mournful melancholy and ecstatic release, untempered passion and raw emotions. What has changed is that now the band has a richer, more varied palette at their disposal with which to tell their stories. There has been a progression from their debut to All At Once to this new album in terms of the narrator’s viewpoint. It began with the immediate gut reaction to pain and hurt, told from within. The second time around, it was an assessment from the road, with the miles of separation lending objectivity to the storytelling. That’s even more pronounced now, as the view pulls out wider. It’s the sort of perspective that comes naturally with the passage of time. The band took a bit of a risk here with Such Hot Blood. With its deeply personal narrative and chock full of sentimental, romantic ballads, it’s not going to be what everyone wants to hear. This is not an album you can dance to, unless perhaps it’s a dramatic waltz. On All At Once, they wanted to show the world what they could do, and prove that they weren’t fixed to any one genre. For this third album, there was less pressure to “prove themselves,” leaving them free to explore where each individual song took them. This beautiful album requires complete immersion with a good pair of headphones to realize how closely bound the song arrangements are with Mikel’s introspective mini novellas. Anna, Daren, Noah and Steven each add their trademark flourishes—a pinch of piano notes here, a dash of viola melody there, a vibrant guitar burst, a percolating bass, a dramatic drum roll… There are also cameo appearances of everything else imaginable, from horns to mandolin, glockenspiel to a touch of tambourine, synthesizer to string section, and even a wistful bit of whistling. Barely a measure goes by that the instrumentation doesn’t change—something goes away, something else dances in. Melodies ebb and flow throughout each song in a complex weave, with poetic lines and repeated phrases that cast light on key issues, the repetitions themselves a metaphor for getting “stuck” in repeating life patterns. What results is a rich soundtrack that tells the story in Greek chorus fashion. This was inspired by recent events, written on the train on my way to work. I would like to thank musician Amanda Palmer for giving me the courage to post this. She wrote a chilling and beautiful poem about Dzhokhar Tsarnaev, the surviving perpetrator of the Boston Marathon bombings. She was then forced to defend her actions on her blog. She wrote her piece in the second person. I take one step closer, in my attempt to understand what happened. The only way to have a peaceful planet is to walk for one day (or 20 minutes) in your enemy’s shoes. There is no “us and them”— it is an illusion that breeds fear, hate and then further violence. You try to understand. How can you? Insulated and safe in your warm homes with your families, whlie the world’s children scream out in pain, from the hunger and the ravages of war. You watch it on the evening news, and it’s so far away. There’s little distinction in your mind between the newsreal and the movie you saw at the cineplex last night at the mall, surrounded by opulence. America’s wealth and arrogance screams out like a heedless vulture, spreading its massive, terrifying wings and overshadowing all below. I was never your child, was never truly a citizen of your madness. My heart is forever of my homeland. Blood ties and heritage are stronger than your educational institutions and superficial trappings. I rode on your trains and watched everyone with their noses buried in their insignificant little lives, their insignificant little mobile devices. I pretended to be buried too, in an attempt to blend in. But I was always an outsider, always marginalized. You listened to me when I said what you wanted to hear; when I behaved as you expected a 19-year-old boy to behave. But I could see the masked intolerance, the charade of freedom. And now you try to figure out why I did it. You debate and speculate and mispronounce my name (and not really care if you do). You sit around in New Age circles and talk about the power of love over hate, right over wrong. It is always a war for you and you are always a combatant, even when you wear your crystals and think you are so connected to the universe. I am connected to my god too. MY GOD. Allah. He told me that I must WAKE YOU UP. Make you see. Make you realize. You can’t hide inside your crystal castles and pretend that the world outside your walls doesn’t exist, doesn’t belong to you. It’s always a case of “I’ve got mine, and screw you,” isn’t it? And now you grieve for one child. One Child. What about all the other innocent little children who have lost their parents in regional conflicts? Who are dead and maimed by oppressive regimes, or by drones that miss their intended targets. You’ll grant a people the right to freedom, but only if their world looks like yours. Only if they’ll convert to your way of thinking, to your idea of justice, your idea of faith. Your sense of truth isn’t big enough to hold the entire world with all its different views that are so alien to your own. But it isn’t “your truth.” It never belonged to you. A charity to help those most affected by the tragic events in Boston on April 15, 2013. 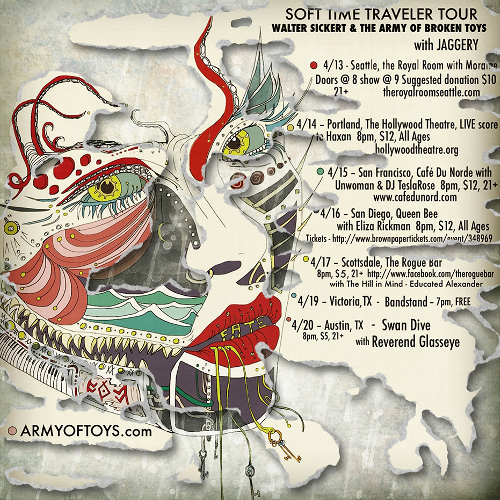 I can think of no better way to come out of semi-hibernation than to promote two of my favorite Boston bands as they hit the West Coast (and Texas, whatever one calls that) — and to indulge in some pony/bunny/unicorn madness. The fact that this uber-strange video (by the inimitable Walter Sickert) seems to fit my current frame of mind is worrying indeed. 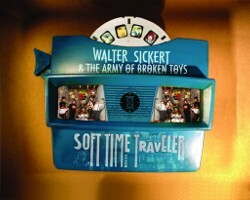 So anyway, Walter Sickert and the Army of Broken Toys have a haunting new album out mere days from now called Soft Time Traveler. It was inspired by Walter’s chance magical encounter with a deer while in Block Island, while reading about the battle between natives and American Colonists. As one might imagine, the music is filled to the brim with beauty and angst. But then, isn’t that always the case with the Army of Toys? They’re heading off with the equally awe-inspiring Jaggery. Have a listen to a few songs from the new offering, which includes one of my live favorites, “Devil’s In The Details.” And let the trance-inducing pony video revert you back to an earlier life form. If you’re not familiar with the epic productions of these two stunning bands, do see them if you can. Also, a full stream of the entire album is available for a limited time only on American Songwriter. Note: Jaggery will be doing shows as a duo (Singer Mali & Tony Leva) on their way back; check the Jaggery site for more details.